The government of Syrian President Bashar al-Assad is no longer under threat of collapse, the leader of Lebanon's Hezbollah group said in an interview with a Lebanese newspaper on Sunday. The comment came as Syrian troops continued to exchange deadly blows with anti-government forces in Damascus and surrounding districts. "The danger of the Syrian regime's fall has ended," Hassan Nasrallah told daily newspaper As-Safir. Hezbollah, an armed Shia group that is allied with the Assad regime in its fight against anti-government rebels, has been instrumental in helping Syria’s military dislodge the opposition from its strongholds along the Lebanese-Syrian border. However, Hezbollah's public role in the deadly three-year conflict has inflamed sectarian tensions in Lebanon. Sunni Muslims who support the Syrian rebels have carried out several attacks in Shia neighborhoods in Lebanon, claiming they are in revenge for the help Hezbollah provides to the Syrian government. Despite the attacks, Nasrallah told As-Safir on Sunday that the threat of sectarian violence in Lebanon "has dropped considerably," crediting his group’s efforts along the border. Syria's conflict began with largely peaceful protests in March 2011, but it has since turned into a civil war that has drawn foreign fighters, including radical groups like Al-Qaeda, which have played an increasingly prominent role among fighters, dampening the West's support for the opposition. More than 150,000 people have been killed in the past three years, and millions have fled, activists say. The violence shows no signs of abating. Mortar shells exploded near the Damascus Opera House on Sunday, killing two, state media said, as rebels intensified their shelling of the Syrian capital to relieve pressure on an opposition neighborhood that government forces have been trying to seize. The opera, officially called the Assad House for Culture and Arts, is located near a cluster of government and security buildings and last year hosted a defiant speech by President Bashar Assad in which he vowed to continue fighting rebels seeking his overthrow. Rebels holed up in the city's rural periphery have focused their efforts on hitting the area, said an activist who uses the name Muaz al-Shami. The Syrian state media outlet SANA said other mortar shells hit nearby areas on Sunday morning. On Saturday, mortar fire injured 22 people in the city. Syrian rebels often fire mortar shells into Damascus from strongholds in outlying communities, but the fire has intensified this week as pro-Assad forces advance on the rural Ghuta suburb to the capital's east, al-Shami said in a Skype interview from the area. 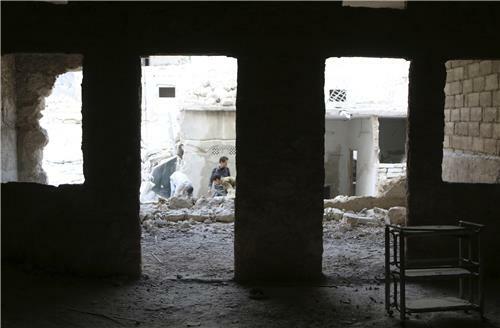 "They (rebels) are trying to shell security strongholds in Damascus. It's an attempt to reduce pressure on the neighborhood," he said. Pro-Assad forces began fighting hard to seize Ghuta — a long-held opposition area — over the past five days, said al-Shami. As he spoke, explosions could be heard in the background. The area has been blockaded for six months. The assault on Ghuta is part of a push by Assad forces to solidify its hold on Damascus by dislodging rebels from the towns and neighborhoods on the city's fringes. The government has used twin tactics to achieve its aims: blockading rebellious areas to pressure them into submission and unleashing artillery and airstrikes on districts that refuse to bend. Last week government forces seized the outskirts of the town of Mleiha, near the Ghouta area. That came after pro-Assad forces severed important rebel supply lines from the eastern Lebanese border into the Damascus periphery. Across the border in Jordan, officials say bloody riots erupted at the largest camp for Syrian refugees leaving at least one refugee dead by gunshot and 31 people wounded. Police used tear gas to break up crowds who attacked the Zaatari camp's police stations and set fire to tents to protest the arrest of compatriots who tried to sneak in a day earlier, they said in a statement Sunday. Thousands of refugees evacuated the east side of the camp where the riots broke out, they said, adding that 29 policemen were injured. Brig. Gen. Waddah Hmoud, director of Jordan's Syrian refugee camps affairs department said a 25-year-old Syrian was killed in the violence and at least two other refugees were wounded. Al Qaeda chief Ayman al-Zawahiri has called for Islamist fighters in Syria to end the infighting that killed a one-time companion of Osama bin Laden earlier this year, according to an audio tape posted online. In the message, Zawahiri mourned the death of Abu Khaled al-Soury, who was killed by an al Qaeda splinter group in a suicide attack in February, and lamented the "strife of the blind that has befallen the blessed land of the Levant." Soury was one of the highest-profile victims of rebel infighting that surged at the start of the year, pitting the Islamic State of Iraq and the Levant (ISIL) against rival rebels including other hardline Islamists. Some 4,000 people have been killed in the clashes, according to the Britain-based Syrian Observatory for Human Rights. The fighting has hindered the battle against President Bashar al-Assad and pushed rival rebel groups to consolidate power in their respective areas of control. "Today this strife requires that all Muslims stand up against it and form a general view against it and against all who do not accept the independent sharia arbitration," Zawahiri said in the audio message, referring to Islamic law. Reuters could not verify the authenticity of the Zawahiri tape, which was posted on Friday, but the voice resembled that of the al Qaeda leader. Al Qaeda said it was breaking with ISIL in February after disputes over the group's refusal to limit itself to fighting in Iraq rather than in Syria, where the Nusra Front is al Qaeda's affiliate. The Nusra Front and ISIL have occasionally clashed since the infighting erupted in January, but they have also fought side by side in some areas and the Nusra Front has tried to mediate between ISIL and rival rebels in others. ISIL is a rebranding of al Qaeda in Iraq, which fought against American forces during the U.S. occupation. It draws strength from a core of foreign fighters and has imposed a strict interpretation of Islamic law in territories it controls. In the audio tape, Zawahiri recalled knowing Soury since the days of the fight against Soviet Union forces in Afghanistan in the 1980s, and called for Islamist fighters to reject the infighting in Syria. "Everyone who has fallen into these sins must remember that they accomplish for the enemies of Islam what they could not accomplish by their own abilities," he said. Soury was born in Syria's northern city of Aleppo in 1963. He was believed to have fought in Afghanistan and Iraq and was more recently a commander in the Syrian Islamist rebel group Ahrar al-Sham. Although he did not specifically refer to ISIL, Zawahiri said Soury had seen echoes of past Islamist infighting in the clashes in Syria. "This sedition which Abu Khaled witnessed and warned of, God willed that it make him a martyr," he said. According to the Organization for the Prohibition of Chemical Weapons, the twelfth consignment of chemicals has been removed from Syria. The OPCW-UN Joint Mission in Syria has confirmed that a 12th consignment of chemicals has been transported to the port of Latakia and removed from the country. Noting this latest consignment the OPCW Director-General, Ambassador Ahmet Üzümcü, expressed the hope that Syria will expedite the removal process. “This is the first shipment since 20 March. It is therefore important not only to follow this up with further rapid movements but also to make up for the lost time by increasing the volumes of chemicals to be removed”, said the Director General. Al-Qaeda military are looking for a base in Syria, The New York Times reports. Dozens of seasoned militant fighters, including some midlevel planners, have traveled to Syria from Pakistan in recent months in what American intelligence and counterterrorism officials fear is an effort to lay the foundation for future strikes against Europe and the United States. “We are concerned about the use of Syrian territory by the Al Qaeda organization to recruit individuals and develop the capability to be able not just to carry out attacks inside of Syria, but also to use Syria as a launching pad,” John O. Brennan, the C.I.A. director, told a House panel recently. The extremists who concern Mr. Brennan are part of a group of Qaeda operatives in Pakistan that has been severely depleted in recent years by a decade of American drone strikes. But the fighters still bring a wide range of skills to the battlefield, such as bomb-building, small-arms tactics, logistics, religious indoctrination and planning, though they are not believed to have experience in launching attacks in the West. Syria is an appealing base for these operatives because it offers them the relative sanctuary of extremist-held havens — away from drone strikes in Afghanistan and Pakistan — as well as ready access to about 1,200 American and European Muslims who have gone there to fight and could be potential recruits to carry out attacks when they return home. Senior counterterrorism officials have voiced fears in recent months that these Western fighters could be radicalized by the country’s civil war. According to the Kuwait Declaration, Arab leaders strongly condemn the Syrian government 'massacres' and demand a political solution to the crisis, Reuters reports. The Syrian civil war is not solved, yet Syria has never been more isolated, President Obama said during the closing press conference at the Nuclear Security Summit. Saudi Crown Prince Salman called on Tuesday for "changing the balance of forces" on the ground in Syria's civil war, saying the crisis there had reached catastrophic proportions. "Exiting from the Syrian crisis requires changing the balance of forces on the ground," Prince Salman told the opening session of an annual Arab summit in Kuwait, stressing the need for more support for rebels fighting to overthrow Syrian President Bashar al-Assad. Syrian state TV quotes a military source as saying the Syrian plane was shot down by Turkey as it pursued rebels within Syrian territory, Reuters reports. Turkish Prime Minister Erdogan has confirmed Turkish armed forces shot down a Syrian jet after it violated Turkish air space, Reuters reports. More than 1 million Syrian refugees — over half of them children under the age of 18 — are scattered around Lebanon, absorbed into local communities or living in informal settlements of five to 500 tents closely packed together. Like far too many other refugees, they struggle with shortages of food, clothing and health care, but their particular circumstances create another problem: social isolation. Living in local communities or informal settlements would not, at first glance, seem isolating. For displaced Syrians, however, isolation has been a challenge unlike any I’ve encountered in refugee camps in sub-Saharan Africa, where I have worked in the past. Isolation is essentially a social challenge, but it is no less significant than other shortages or crises that tend to affect displaced persons. It is a multifaceted affliction. The first layer is isolation from one’s homeland. Surrounded by torture, mass killings, detentions and summary executions, and lacking sufficient food and medical services, Syrian families have no choice but to flee their homes. In doing so, they leave behind everything that was familiar and all that they loved: family and friends; neighborhoods and communities; customs and routines; favorite places and cherished personal belongings. This form of isolation is to be expected — I had seen it many times before in my work. But what caught me by surprise in my interviews with Syrian refugees late last year was a second layer of isolation, from the Lebanese community. The absence of formal settlements means that Syrian refugees are scattered throughout Lebanon and remain segregated even as they live among their hosts. Many Syrian families told us that they don’t socialize with their Lebanese neighbors. Lebanese citizens similarly reported that they do not allow their children to play with Syrian refugee children. The Lebanese education system is under enormous strain as it struggles to accommodate Syrian students. Even though most Syrian children are still not attending school, others are being accommodated in shifts — with Lebanese students attending half the day and Syrian students attending the other half. While this is beneficial educationally, it continues to create a divide between the two communities. Russia's Foreign Ministry said on Wednesday that the decision by the United States to suspend operations of Syria's embassy in Washington and consulates n other cities was "worrying and disappointing". Worsening relations between the United States and Russia over Ukraine in recent months have clouded efforts by the two countries to broker a peace deal in Syria, which is in its fourth year of civil war. Last month at a rally for Gen. Abdel Fattah el-Sissi in Cairo, children could be seen throughout the crowd balancing boots on their heads for the cameras. This is the latest visual metaphor in the streets of Egypt and Syria: the jackboot. The message: total submission to the new military regime. In Syria supporters of President Bashar al-Assad announce their loyalty to the government using the same symbol with a floral twist. A monumental pro-regime jackboot statue in the devastated city of Homs is filled with huge colorful blooms, while the most frenzied pro-regime Syrians favor putting real military boots full of flowers on their heads, sometimes even kissing the boots. In the fast-moving semiotic arena of the last three years of upheaval in the Arab world, this is one of many iconic images that have emerged in the lexicon of the Arab street for the attention-deficient global press — Mohamed Bouazizi’s self-immolation, which sparked the uprisings; the “Dégage!” (Get out!) slogan that forced Zine el Abidine Ben Ali from Tunisia; the tweets and video clips of the long-gone Egyptian revolution of #Jan25. Three years on, these powerful symbols of popular resistance to authoritarianism are spent, and the disturbing kitsch of fascism has taken their place. A verbal corollary is the “terrorist” label. The Palestinians have fought for decades against the demonizing label used indiscriminately by the U.S. and Israel, but now Middle Eastern governments have seized on “terrorist” with gusto to dehumanize and make scapegoats of their domestic opponents. The Assad regime staved off effective international action for its massive crimes against humanity by portraying its civil opposition as a monolith of terrorism. In Egypt the anti–Muslim Brotherhood witch hunt purports to ascribe all the evils of a deeply flawed system to this “terrorist” minority. The Russian Foreign Ministry says the United States' decision to shut the Syrian embassy is 'worrying and disappointing,' Reuters reports. The United Nations has added to its list of suspected war criminals attached to the Syrian civil war, Reuters reports. United Nations human rights investigators have added to their list of suspected war criminals from both sides in the Syrian civil war after a new round of atrocities in recent weeks, its head said on Tuesday. The U.N. inquiry has identified military units and security agencies as well as insurgent groups suspected of committing abuses, Paulo Pinheiro told the Human Rights Council. Four confidential lists of suspects on both sides have been drawn up to date. "This 'perpetrators list', as we call it, contains names of persons criminally responsible for hostage-taking, torture and executions," said Pinheiro, a Brazilian chairing the inquiry. "It also contains names of the heads of intelligence branches and detention facilities where detainees are tortured, names of military commanders who target civilians, airports from which barrel bomb attacks are planned and executed, and armed groups involved in attacking and displacing civilians." In its update report, the U.N. commission of inquiry on Syria said the period of January 20 to March 10 was marked by escalating hostilities between insurgent groups throughout northern and northeastern provinces as Islamist rebel strongholds came under attack. The New York Times' Anne Barnard takes a look at what three years of civil war has truly done to Syria. Day after day, the Syrian civil war has ground down a cultural and political center of the Middle East, turning it into a stage for disaster and cruelty on a nearly incomprehensible scale. Families are brutalized by their government and by jihadists claiming to be their saviors as nearly half of Syrians — many of them children — have been driven from their homes. At the start of the fourth year since Syrians rose up in a peaceful movement that turned to arms after violent repression, a snapshot of the country presents the harsh truth that Syria’s descent is only accelerating, with nothing to check it. The government bombards neighborhoods with explosive barrels, missiles, heavy artillery and, the United States says, chemical weapons, then it sends in its allies in Hezbollah and other militias to wage street warfare. It jails and tortures peaceful activists, and uses starvation as a weapon, blockading opposition areas where trapped children shrivel and die. The opposition is now functionally dominated by foreign-led jihadists who commit their own abuses in the name of their extremist ideology, just last week shooting a 7-year-old boy for what they claimed was apostasy. And some of those fighters, too, have targeted civilians and used siege tactics. #Syria Israeli border An Israeli army jeep drove over explosive device near Syrian border . Reports of 2-3 wounded . The Israeli military says a bombing has wounded several soldiers along the Syrian frontier, The Associated Press reports. A California man who prosecutors say was on his way to Syria to join an Islamist militant group was arrested on Monday near the U.S.-Canada border in Washington state on a charge of attempting to provide material support to a terrorist organization, federal officials said. The U.S. Department of Justice said in a statement that 20-year-old Nicholas Teausant had planned to cross into Canada and travel on to Syria to join an al Qaeda-linked militant group, the Islamic State of Iraq and Syria. According to federal prosecutors, a California man arrested the United States-Canada border on a terror charge had been headed to Syria to join a militant group, Reuters reports. Syrian government troops backed by Hezbollah fighters took full control of the strategic town of Yabroud on Sunday after driving out opposition forces, helping President Bashar al-Assad secure the land route connecting the capital city of Damascus with Aleppo and the Mediterranean coast. The fall of Yabroud, the last opposition bastion near the Lebanese border, could sever a vital insurgent supply line and consolidate government control over a swathe of territory from Damascus to the central city of Homs. The army "restored security and stability to Yabroud … after eliminating a large number of terrorist mercenaries," the Syrian military said in a statement hailing the strategic victory. A military source said that about 1,000 fighters from the Al-Qaeda-linked Nusra Front had held out on Saturday to fight government forces, which had entered eastern districts of Yabroud and captured several hilltops. "They fought a fierce battle and then from last night until the early hours of today they all pulled out," he said. The source said the militants had withdrawn to the nearby villages of Hosh Arab, Fleita and Rankos as well as Arsal, a Lebanese border town 13 miles to the northwest. Hezbollah-operated Al Manar television broadcast scenes from Yabroud's main square, where people walked around and talked in apparent safety. Soldiers replaced the three-star flag of the Syrian revolution with the government's two-star banner. Footage from earlier in the day showed empty streets, shuttered shops and abandoned homes in a main thoroughfare. Heavy gunfire could be heard in the background. A reporter asks Ban for his reaction to comments from Syrian ambassador Jafaari that upcoming elections in Syria are essentially none of the UN's business. "In the case of Syria, while we are now engaging in the negotiations, the main purpose is to establish a traditional governing body. That depends on who becomes the candidate for the presidency," says Ban. "When Assad becomes a candidate, this will make moving the Geneva peace process ahead very difficult. " UN Secretary-General Ban Ki-moon is addressing the press now. "After two rounds of talks, neither side is displaying any will to compromise or any awareness of the suffering of the Syrian people," says Ban. "All those who persist in seeking a military solution are making a political solution more distant/"
Al Jazeera's James Bays asks Jafaari if he's "unhappy" with how UN envoy Brahimi is performing his role -- Jafaari has previously told Brahimi to 'behave' in a meeting on Syria -- and whether the Crimea crisis is distracting from the crisis in Syria. "Sometimes the special representatives go beyond their mandates," says Jafaari. "And I need to remind them that 'guys, you have limits.'" A reporter asks Syrian ambassador Jafaari is Syria is opposed to parallel talks to bring an end to the ongoing Syrian civil war. "I know that you are a seasoned report and an experienced reporter, but I don't like the way you're asking this, and you must have missed my comments." Jafaari responds. "Mr. Brahimi chose himself to put combating terrorism as item #1 on the Geneva agenda, because *he* felt that combating terrorism was a priority. The other side misinterpreted the meaning of 'combating terrorism', and this is where things got stuck." 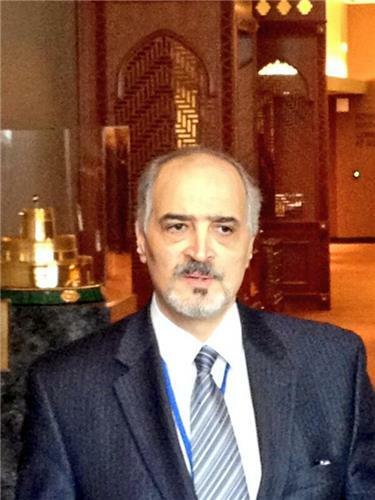 Syrian ambassador Bashar Jafaari has essentially hijacked Secretary-General Ban's press conference. The press is very unhappy with him. #syria amb: i told Joint Special rep to behave and be responsible. According to RIA, the Russian Foreign Ministry says all chemical weapons which should be destroyed outside Syria could be removed from the country by April 13 and there is no need to adjust the timeframe, Reuters reported early Friday morning. 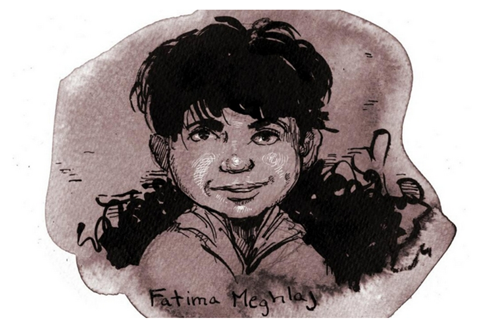 As the third anniversary of the conflict in Syria approaches, a pair of online campaigns are aiming to put a face to the victims of the conflict and inspire action to help those in need. Both campaigns are accompanied by significant offline action in the form of vigils, protests and calls for aid. 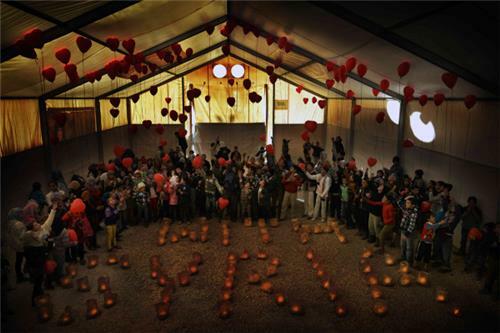 A coalition of 50 humanitarian and human rights groups is using the hashtag #WithSyria to broadcast information about vigils around the world and ways to contribute to aid efforts. President Bashar al-Assad visited displaced Syrians in the town of Adra on Wednesday, state media said, in a rare public appearance outside the heart of Damascus. State television said Assad inspected a shelter for people displaced by fighting in Adra, which lies about 12 miles northeast of central Damascus and was partly captured by rebels three months ago. A picture on the presidency's Twitter account showed Assad, in a dark jacket and white shirt, talking to a group of women at a building identified as the Dweir shelter. Syrian television said Assad was "listening to their needs" and told them that the state would continue "to secure basic necessities for the displaced until they can return to their homes in Adra and elsewhere". 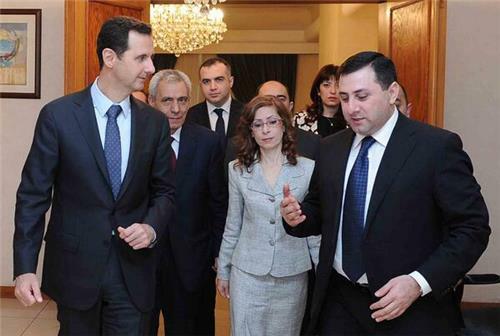 Assad has made few public appearances since Syria's conflict began three years ago. Wednesday's trip underlined his increasing confidence just 18 months after rebels appeared to be challenging his control over the capital. Adra, close to rebel strongholds east of Damascus which are under siege by Assad's forces, is located by the main highway running north from Damascus to Homs which the army has fought to secure from rebel fighters over the last year. Many residents fled Adra in December when mainly Sunni Muslim rebels took over part of the town and killed 28 people in a sectarian attack targeting Druzes, Christians and Alawites - the same sect to which Assad belongs. Adra had a population of about 100,000 including Alawites, Druzes, Christians and Sunni Muslims before the conflict erupted. The Syria crisis, which began with protests against more than 40 years of Assad family rule, became militarised after authorities cracked down on demonstrators and has descended into a civil war in which 140,000 people have been killed. Assad's forces, backed by Shi'ite powers Iran and Hezbollah, are fighting Syrian rebels backed by foreign jihadis and have secured much of the center of the country. Authorities have rejected opposition calls for Assad to step down and are preparing for a presidential election later this year. UNICEF estimates 1 in 10 Syrian refugee children is now working and 1 in every 5 registered marriages of Syrian women in Jordan is a child.